Krill Oil Gold features NKO Krill Oil, the most clinically studied krill oil in the world, sourced from certified sustainable Antarctic krill. Krill Oil Gold provides a natural source of highly bioavailable omega-3 fatty acids bound to phospholipids. The naturally occurring astaxanthin in Krill Oil Gold provides powerful antioxidant protection from free radical damage to support cardiovascular, cognitive, joint, eye, and skin health. 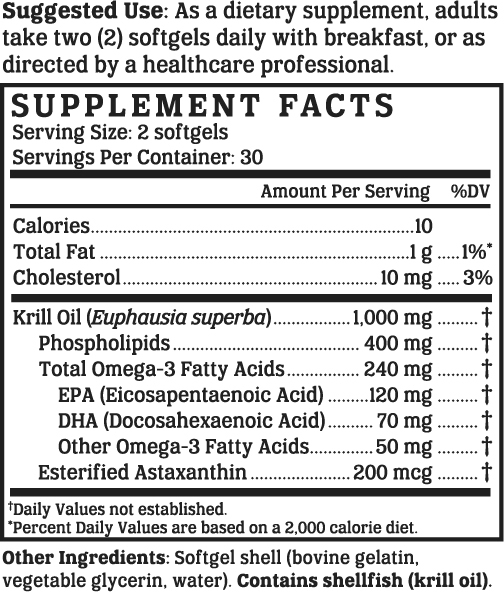 Krill Oil Gold is manufactured in the USA to industry-defining quality standards and is verified by independent third-party labs to meet identity, purity, and potency label claims. Friend of the Sea is a nonprofit organization whose mission is the conservation of the marine habitat. Their official seal on Krill Oil Gold indicates that the product meets all of their stringent qualifications. We like to make supplements that can be enjoyed by everyone. That's why our products are always compliant with the best practices for avoiding allergens and minimizing cross-contamination. 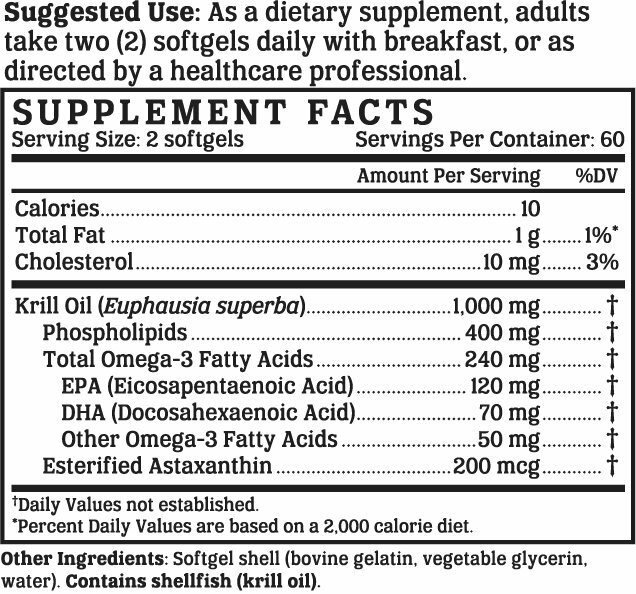 Krill Oil Gold is free of soy, gluten, egg, milk, peanut, and corn allergens. Consistent with our guiding principle to “do no harm,” Krill Oil Gold is manufactured without the use of additives or preservatives. It contains absolutely NO contaminants, pesticides, herbicides, harmful additives, residual solvents, magnesium stearate, or hexanes. Like all NutriGold products, Krill Oil Gold is subject to over 140 purity and potency assays by independent, third-party labs to ensure that the product meets or exceeds its claims. So, you can be certain that what's on the label is what's in the bottle. Nothing more, nothing less. No articles featuring Krill Oil Gold have been published yet.